The human tongue is a multifunctional tool. Without it, speaking, eating, swallowing and tasting would not be possible. The tongue has many different receptors (sense cells), which take on different tasks, which essentially allow us to distinguish the taste sensations sweet, sour, salty, bitter and hearty-spicy. The back of the tongue gets its rough structure through a variety of so-called papillae. At birth we have about 10,000 of these taste buds. Their number decreases continuously in the course of life, until finally only about 2,000 of these taste buds are left. The tongue with its rough, furrow surface provides an ideal breeding ground for bacteria of all kinds. Therefore it is only logical that 60 to 80 % of all bacteria that colonise the oral cavity are found on the tongue. Here, they can settle and multiply without any disturbance from conventional oral hygiene activities such as brushing. Since also food residuals and dead skin cells accumulate in the furrows of the tongue, the bacteria find abundant food, which they absorb and decompose by metabolic processes. During this process, smelly sulfur-containing gases are produced. If the number of bacteria on the posterior surface of the tongue is increased, the concentration of these gases also increases, and the odor of the mouth arises. Therefore, the solution is to clean the tongue, as the bad breath will vanish as these tongue coatings are being removed. Studies have revealed that every fourth German is suffering from bad breath from time to time and 6 % will suffer from it in the long-term (Seemann 2002). Although these figures show that halitosis, the medical name for bad breath, is widespread, there is still a great need for explanation. 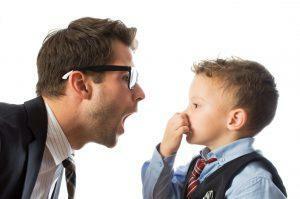 Essential knowledge: In 9 out of 10 cases, bad breath originates in the oral cavity. If you are seeking medical advice, you should always speak to your dentist first. The cause of bad breath is bacteria or rather the products of its metabolism that result when food is broken down in the mouth, especially on the tongue. This releases foul-smelling sulphur compounds. Bad breath can result if these bacteria multiply in the oral cavity or if they are not removed regularly. Alongside with poor oral hygiene, the following are factors that cause bad breath: Damaged teeth, swellings of the mucous membrane, insufficient flow of saliva, mouth breathing, snoring, alcohol and smoking. The number of bacteria that occupy the oral cavity must be reduced in order to tackle the bad breath caused by bacteria. Niches caused by regression where bacteria could develop undisturbed are identified and cleaned. For example, this includes renovation of damaged crowns and fillings and treatment of caries and periodontitis. Other important measures are the use of a tongue-cleaner and antibacterial mouthwashes as well as professional removal of coatings, including from between the interdental gaps, and tartar. Most household remedies like chewing gum, parsley or cloves only cover up bad breath without tackling its causes. Experts recommend cleaning the tongue 2 to 3 times daily. There are special tongues-cleaners available in drugstores and pharmacies. These should be adapted to the tongue form, very shallow and not too sharp. They also reach the sensitive back third of the tongue, the so-called dorsal region, without a gag. Here, the indentations of the tongue are more pronounced and the bacterial grasses are therefore particularly dense. In practice it has been shown that instruments that combine the brushing and scraping functions achieve the best results. 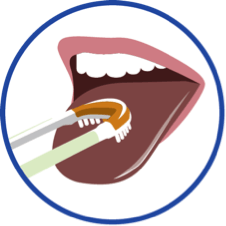 For by brushing, the bacterial deposits are dissolved first, and can then be drawn with the scraper more thoroughly from the tongue surface. Which device is the right one? Easy cleaning is important: Too long and too dense bristles, as well as fabric pads or slats, provide retreats for bacteria. A toothbrush is not a tongue brush. They do not have the optimum shape, e.g. too high and therefore easily cause an unpleasant gag reflex. They do not reach the back of the tongue. Tongue brushes loosen the coatings but do not effectively remove them. Tongue scrapers can only remove loose material. Deeper deposits in the tongues remain intact. Therefore always choose a combination of both, like our combined tongue-cleaner professional deluxe. Be careful! The tongue is a sensitive organ. Tongue scrapers with sharp edges or metal can damage papillae and taste buds. This also applies to an inverted spoon. With regular use, a tongue cleaner should be changed every 8 weeks at the latest.